PT Freeport Indonesia - Freeport Indonesia hereinafter referred to as "PTFI" is a reputable mining company from Indonesia. PTFI is based in the highland areas of Mimika District Papua Province and engaged in the field of exploration, mining and processing ore containing gold, copper and silver. PT Freeport Indonesia is an affiliate company of world leading copper and gold mining company Freeport McMoRan Copper and Gold, Inc (Freeport Group, NYSE:FCX). Freeport Group is an US-based company with operations in Asia and Spain. According to information found in Freeport Indonesia's websited as cited by JobsCDC.com, PT Freeport Indonesia has 212,950 hectare of concession area with proven reserves of 2.52 billion tons of ore as at the end of December 2011. 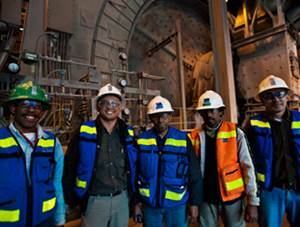 As of December 2014, PT Freeport Indonesia supported by 12,036 direct employees and over 18.000 contractor employees. Education minimum Bachelor Degree or equivalent (D4 or S1), majoring in following disciplines Statistics, Law, Environmental Engineering, Chemical Engineering, Sociology, Electrical Engineering, Social and Political Science, Architecture Engineering, Civil/Structure/Geotechnical Engineering, Hospitality, Marketing, Public Health/Occupational Health and Safety, Economic Accounting/Finance, Communication, Informatics Engineering.. Minimum GPA of 2.80 (Non-Papuan participants) and 2.50 (Papuan participants) out of 4.00 scale. Not more than 2 years since graduation. Have limited work experience (0-2 years). Maximum age 30 years old for Papuan participants and maximum 26 years old for Non-Papuan participants. Demonstrate high levels of integrity, willingness to achieve results and willing to be placed in remote areas. JobsCDC.com now available on android device. Download now on Google Play here. Please be aware of recruitment fraud. The entire stage of this selection process is free of charge. PT Freeport Indonesia - FPG Fresh Graduate Program PTFI April 2018 will never ask for fees or upfront payments for any purposes during the recruitment process such as transportation and accommodation.